daydreams in gold: another foundation review! This offering from Illamasqua is DEFINITELY, without a shadow of a shadow of a doubt my 'Holy Grail' foundation. It is 100% the best I've used so far. This is my second repurchase of this, meaning my third bottle! I wear shade 02 which is just one step up from white, and the more pink toned out of the pale shades. I did originally try out shade 03 but it leant far too yellow on me. This foundation is AMAZING - honestly, I couldn't sing it's praises any more (I can always try, however). It is supposedly Illamasqua's take on a BB cream; it has a natural flawless finish, whilst still maintaining heavy coverage. You literally only need the tiniest bit of this and it covers your whole face. 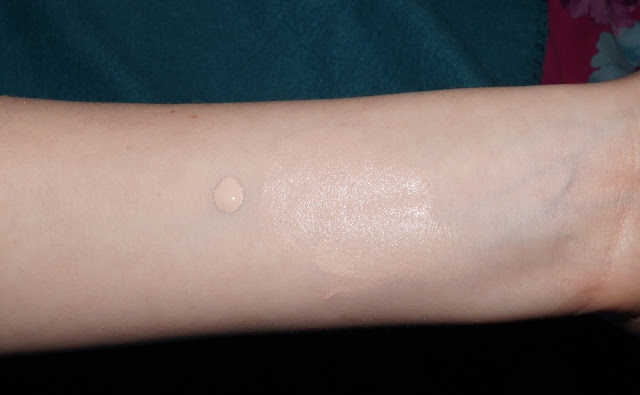 As you can see the foundation has pretty high coverage, and matches my skin perfectly. the only problem I have with this foundation is that it is quite matte when dried, although it has to be set with powder around my nose and eyes because it does tend to slide. It can also be quite drying on the skin. This isn't a problem for me though I just slap on the moisturizer and highlighter!! Have you ever used this foundation before? How did you find it? Did you love it as much as I do?